Trivia Tuesday’s are here EVERY week! With Tim & Tanya, great prizes and giveaways PLUS cash Jackpot each week! 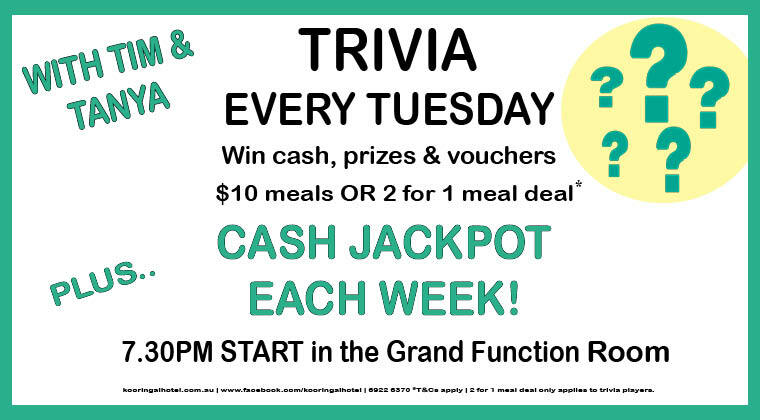 WE have our $10.00 dinner specials OR 2 for 1 meals when you play TRIVIA! Call 6922 6370 to book your team in! DARTS are here at the Kooringal Hotel. Every Wednesday night at 7pm, you can show us your skill, aim and banter in this fun sport! We have prizes to win plus food & drink specials on the Night! $13.00 Pizza’s (all pizzas on the menu). 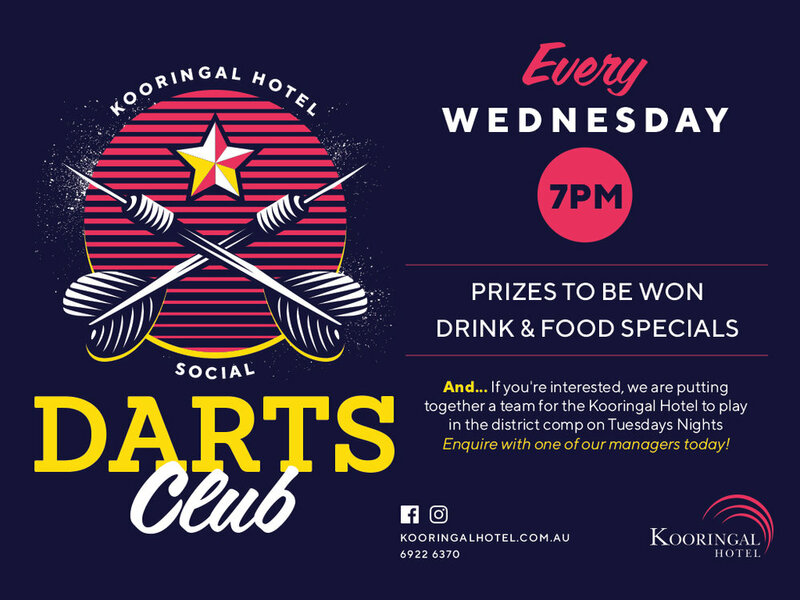 And if you are interested, the Kooringal hotel are putting a team together to play in the district comp on Tuesday nights! Just ask one of our managers today! Anzac Day, 25th of April marks the anniversary of the Australian and New Zealand forces landing on Gallipoli in 1915 during the First World War. > A BBQ Breakfast starting at 7am, after the Dawn service at Victory Memorial Gardens. 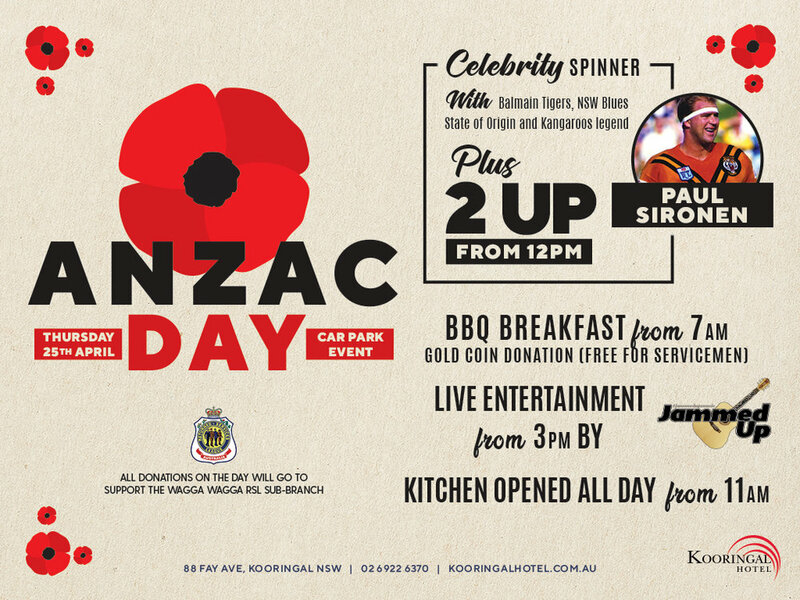 A gold coin donation is accepted for the BBQ Breakfast with the donations going to Wagga RSL Sub - Branch (FREE for Serviceman). > Two - up from 12pm with Spinner Paul Sironen from the Balmain Tigers, NSW Blues SOO and Kangaroo Legend in the tent! Join us this Anzac Day as we commemorate our soldiers & celebrate our Australian history & culture. *This is a carpark event and closure on the day will take place | all donation raised on the day will go support the Wagga Wagga RSL Sub-Branch. Kooringal Hotel LOYALTY DRAW every Monday & Thursday Nights! Vouchers, Free meals and drinks, meat voucher PLUS Major Cash PRIZE! 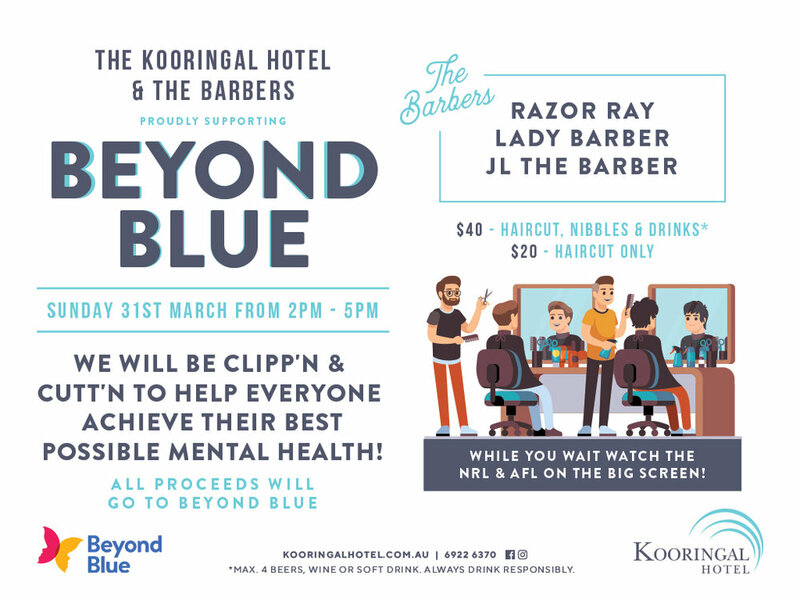 The Kooringal Hotel & The Barbers supporting Beyond Blue! Beyond Blue provides information and support to help everyone in Australia achieve their best possible mental health, whatever their age and where they live. On the 31st of March from 2pm - 5pm The Barbers JL the Barber Razor Ray & Lady Barber will be Clipp'N & Cutt'N to support Beyond Blue. All proceeds on the day will go directly to Beyond Blue to help you achieve YOUR best possible mental health! St Pat’s Weekend is at the Kooringal Hotel! Friday 15 to Sunday 17 of March! Junior Football & Netball organising meeting to be held at the Kooringal Hotel on Sunday 10 March @ 10.30am. All welcome! 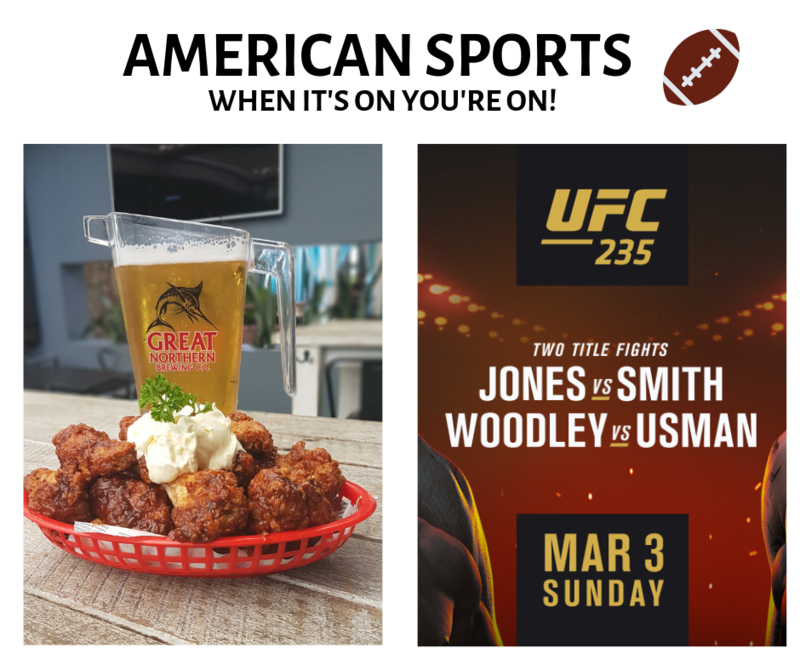 UFC 235 showing live on Sunday March 3 from 1pm! The Kooringal Hotel are celebrating seniors this February. FREE Coffee & Cake with a purchase of a main meal. Come into the Kooringal Hotel and we’ll look after you. Sunday 10th February from 2pm! On February 8th see the Gallen Vs Hopoate fight live and loud in our Bar & Beer Garden. Can the courageous captain of the Cronulla sharks, Paul Gallen beat the ex sea eagles bad boy John Hopoate at a Star of the Ring Charity Fight Night at the Hordern Pavilion in Sydney. Tim Tszyu 11-0-0 fights for the Commonwealth Title and former Brisbane Broncos Captain, Justin Hodges makes his boxing debut! American Sports, when it's on you're on!! Starts at 10.30am... Complimentary American HOTDOGS at 11am..
Watch all the action on the BIG screen with surround sound! Will Tom Brady add to his legacy?? Come in and find out! Trivia Tuesday’s are here EVERY week! Starting Tuesday 29th of January at 7.30pm. School is on it’s way back, so why not get a fancy haircut by the guys from Ross C Barbershop! On Sunday 27th of January from 11am - 3pm - JL The Barber, Razor Ray The Barber & Barber Jax will be Cutt’N & Clipp’N to make you look your BEST for the first day back at school! Proceeds raised on the day will go to Kooringal Public School.